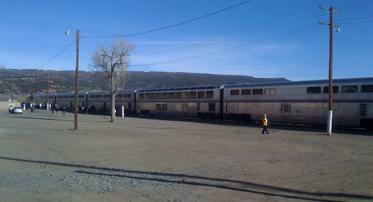 As many of you know, my wife and I traveled by Amtrak again this year across the country for the holidays. Last year we took it from Los Angeles to Chicago, and this year we went from Albuquerque all the way to Boston. For all your environmental talk, Amtrak, you sure don’t do a good job of doing any on-board greening of the trains. There, I said it. On their website, Amtrak prides itself on how “green” they are – which they are kind of by nature just in being a train. Trains are more 17% more efficient than airline travel and 21% more efficient than auto travel on a per-passenger-mile basis; you get much more bang for your buck, so to say. Amtrak also is a member of the Chicago Climate Exchange, the world’s first legally-binding integrated greenhouse gas reduction and trading system. They are reducing their diesel emissions, working on making their trains more fuel-efficient, reducing the time locomotives idle in place, and are substituting electric trains for diesel ones along certain corridors – all of which are great things to be doing. But where they are failing is inside the train, where the passengers are. When we take Amtrak we always pay for our own room, as then you get an actual bed and you get all your meals included for the entire trip. In these rooms, you get little tiny plastic bottles of water every day. There are places to get drinking water on board, so I am not sure why they need to provide bottled water for every sleeping car passenger. And these bottles don’t even seem to be recycled as they go in the trash along with all the other garbage. I seriously doubt someone sorts all those bags of garbage when they unload it at the different stations along the route. In addition to the bottled water issue, the toilet paper, coffee cups, and paper towels in the bathrooms are not made from recycled paper – at least they don’t say that they are on the label. That stuff is available everywhere for both individual and corporate use, so there is no reason that Amtrak should not be using recycled-content paper products. And in the dining car, everything is plastic – from the utensils to the cups to the plates. Some of this, I hope, gets washed – but I seem to remember that there used to be actual silverware and glasses in the dining car. Is this a new cost-cutting move, Amtrak? Because if so, you are cutting small costs at the expense of the tossing of a very large amount of plastic. And if you are in-fact washing some of the dishes downstairs, why not wash all of it? So while your trains are more efficient than traveling by air or car, and you are certainly doing your part to increase your efficiencies, I am afraid you are neglecting a big part of your environmental footprint – the inside of your trains. And as much as I wanted to, I could not have lugged all that plastic off the train myself, so it went right in the trash, where it was probably headed straight for a landfill in whatever city we stopped in. I will be copying this post into a letter to be sent to all of the Big Wigs at Amtrak, but if you happen to read it here first – can you please do something to clean up what goes on inside as well as outside of your trains? You know where to find me if you want to talk…and until then, I hope our next trip is even “greener” than this one was! I hope to see it everywhere someday – we need to get on the ball and catch up with Europe! You are so lucky to get Amtrak! It goes all the way around SD, and we are a rather bare state granted, but it would be great to be able to access some accessible transportation to go across the state. I took them before, and the have a accessible car for wheelchairs, including the bathroom, and had to have someone go get the food for me, but other than that, it worked for me. If it would just go through the state from Sioux Falls area through to the Black Hills would be great! I agree with you on all the waste with the plastic, and not using recycled products. Well put and well argued. I’m with Jenni, despite the abundance of train traffic in Northern Colorado (and along the Front Range of the Rockies in general) there is a real lack of passenger train options. As it currently stands, the tracks are too full of coal, gas, and forest products to make room for anything else. Will be sure to let you know if I hear anything Allan! And in the dining car, everything is plastic – from the utensils to the cups to the plates. Some of this, I hope, gets washed …. The problem is that several years ago Congress mandated that Amtrak cut cost in the food service cars. Amtrak’s solution was to eliminate the person who washed the dishes and replace that person with high priced plastic “china” That china is sure to coat more that the person whose job they elininated. The plates are around 90cents a piece and the salad bowls about 50 cents. And if you are in-fact washing some of the dishes downstairs, why not wash all of it? You only have one person downstairs doing preperation, that’s the “chef”. Why can’t they recyle aluminum cans would be another green question. Joe Boardman Amtrak’s new CEO is said to be addressing these issues presently.